Home Comment What to do about Apu? What to do about Apu? 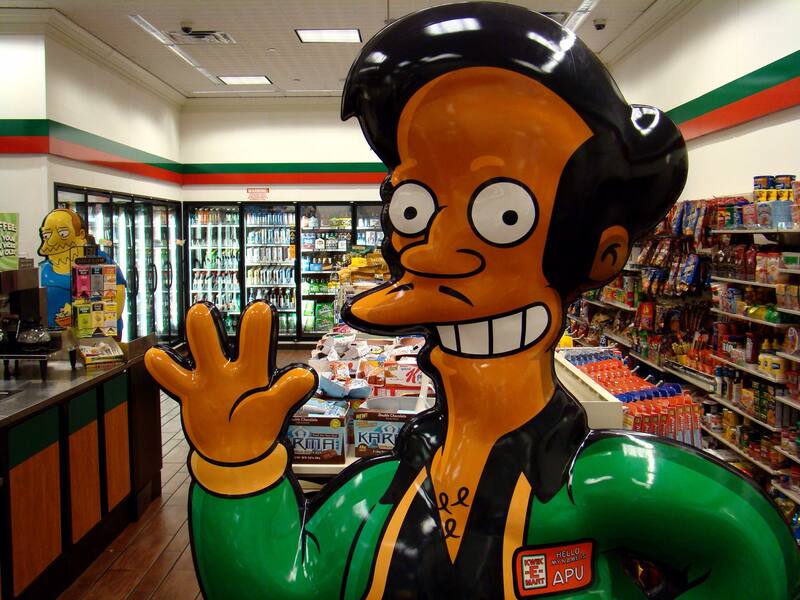 Last year Indian American comedian Hari Kondabolu released the independent documentary ‘The Problem with Apu’ which details the grievances a collection of Indian American comedians have with the heavily stereotyped character in the Simpsons, Apu Nahasapeemapetilon. In the past month or so this controversy has blown up as the Simpsons replied to the documentary in an episode with the character Lisa. Recently Priyanka Chopra, a high profile Indian actress weighed in on the issue on American TV and now it feels like we’re all starting to talk about the issues faced by South Asians and Hindus that go beyond direct discrimination and move into the subtleties of representation and our spaces in the media. As a white Hindu I fit into this conversation in a rather strange place, can I really offer a commentary on Apu if I’m only partially affected by his stereotypical portrayal? I both exist as the person Apu is marketed to, a predominantly white audience sitting comfortably in the middle of society, but at the same time Apu’s character traits follow me when I, as a Hindu, occupy social space. It is important that Hindus and South Asians both offer their commentary on this issue as we (Hindus) haven’t existed in the media and in the public sphere really at all besides the presence of Apu. South Asians are in the exact same position and as these two identities became synonymous in Apu it is important to acknowledge Apu’s effect on both communities so that we can work to remove the idea of a racialised Hinduism or a Hinduified South Asian identity. For the longest time Apu was, for myself and for a lot of white people, both here and in the US, our first introduction to an Indian person. I remember growing up thinking Apu was an accurate representation of Indians and of Hindus, it is through Apu that I learned about the god Ganesha who I now worship daily. So Apu has a lot of power as a character, it’s fair to say the Simpsons itself is so embedded into pop culture that any of the main characters are, indeed very powerful tools in how the public perceives people. It is strange to think that the Simpsons, with it being this embedded, can be problematic but if you dig deeper a lot of the characters are stereotypes of their given background and they inform our entire impression of these groups. The difference between say Ned Flanders, a caricature of Christians, and Apu, is that Apu is representing already stereotyped and marginalised communities that some people in the Simpsons audience have never met in real life before. What is initially a fairly benign, or unintentionally racist character becomes a weapon used to push the Indian and Hindu communities into a space where they are subject to ‘Apuisms’ as a form of discrimination. The accent Apu speaks with for example is not actually representative of how any South Asians speak at all, Apu is voiced by Hank Azaria, who is white. This ‘Apu accent’ has impacted on the careers of actors of South Asian heritage for 30 years, a common trope for Indians in Hollywood is to make their voices sound more like Apu’s. As someone who speaks Hindi, one of the main languages in India, the ‘Apu accent’ is something I am asked about sometimes often alongside being asked if I speak ‘Indian’. The level of frustration I feel as a white Hindi speaker with an English accent, I can imagine only factors a tiny level of the hurt and irritation a South Asian person must feel when they have to prove their authenticity as a South Asian because they don’t sound like Apu. I think it is important to point out that I don’t think Apu is intended to be racist, the Simpsons bases a lot of its humour around stereotyping people, even Homer is a parody of the blue collared Middle American worker. It is fair to say that Apu is also seen as one of the better characters in Springfield, he holds at least one master’s degree, runs his own business and is portrayed as kind, smart and resourceful. In 1990, in the episode ‘The Telltale Head’ when we first met Apu he was revolutionary as a character, for a brown character with, what the writers think, is a strong connection to a home culture and adoptive culture, was something entirely new to the world of American and British TV at the time. But now thirty years has passed and people who were born in the age where this is was a good and fair representation have grown up being called Apu all the way through school, they’ve heard ‘thank you come again’ be used as a slur for the last time. We as a culture have developed. Some people in the conversation about Apu argue that the very age of the Simpsons and the character of Apu makes it immune to the changes in our public perception. The idea that as a cultural institution the Simpsons should be given a free pass to continue their offensive depiction of Hindus, South Asians, and other groups hurt by similar characters (see Bumblebee Man, Cookie Kwan and Groundskeeper Willie) because at the time it was perceived to be okay to me feels reductive. The Simpsons is not impervious to change and given the response by Hank Azaria, Apu’s voice actor, stating his willingness to hand the role to a South Asian, shows an interest from within to tackle this issue. As someone who has grown up loving the Simpsons, and genuinely liking Apu’s character, it is a complicated and messy situation that we’re all in. I think Apu needs to be given a seriously better deal with how he’s depicted, a change in voice actor and a more accurate portrayal of Indian and Hindu culture would remedy much of this problem. It’s difficult because we need to ask how much other cultures can poke fun at each other without it crossing the boundary that Apu has, unintentionally crossed. There’s not a clear answer to what we do about Apu and there’s even less of a clear answer to what we do about the damage to the South Asian community Apu has caused. Even if the voice actor is changed and even if Apu is written with more cultural sensitivity, what can be done about all the thirty years of episodes with Apu in them that have become references for Indians, India, Hindus and South Asia on a whole? It leaves us asking still, what to do about Apu?